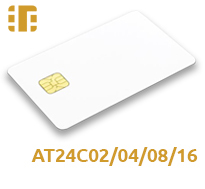 AT24C02 contact memory smart card is a card without encryption process. This card contain 2K-bits EEPROM memory size, R/W (non protected). Contact memory smart card AT24C02 is optimized for use in many industrial and commercial applications and security systems. AT24C** series includes: AT24C01, AT24C02, AT24C04, AT24C16, AT24C64.